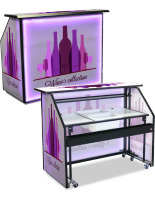 A Transportable Bar Turns any Event into a Party! 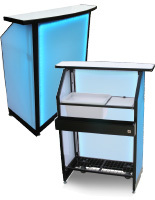 Looking for an event beverage solution for the next wedding, trade show or corporate event? 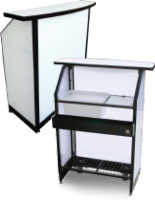 Look no further than a transportable bar to distribute drinks and make transactions. 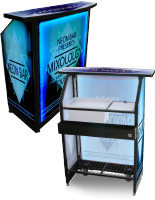 Many event planning companies, catering companies, hotels and restaurants use these bars to mix and distribute both alcoholic and non-alcoholic drinks to partygoers in any setting. Their wheeled bases, using industrial strength casters, allow them to be pushed across the convention center, dance floor or hotel lobby with ease. 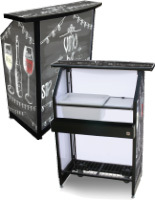 Position these lightweight, compact bars in the most convenient location for both the bartenders and the guests without pulling a muscle! 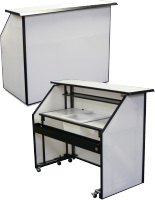 These transportable bars have small enough dimensions to fit into midsize or larger vehicles and drive to events. What are some of the features that can be found in these bars? 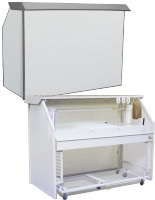 Make sure to review the product specifications for the complete details of each bar. 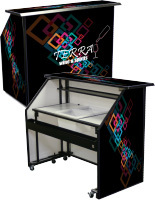 These transportable bars are not only functional, but also flashy, trendy and can help to promote a brand or send a message. 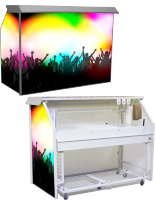 LED lights make the bar easy to locate, even in dark dance halls or outdoor events at night. 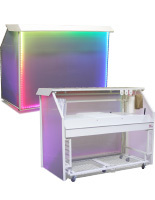 Many of them are built with custom printed graphics that allow the event coordinator to advertise a personalized logo. Follow the artwork guidelines to create your very own custom bar! These are perfect for alcohol brands who are promoting a new product, a brand at a trade show attempting to win over new clients, or a catering company advertising their brand for the guests in attendance. 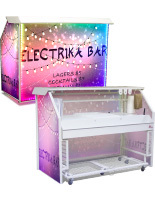 Transport one of these bars to your next event for a dual branding and service effort that will make a mark on your guests and leave them feeling satisfied!